Size: 3.3" x 5.1" x 0.70"
Nothing else like the PocketMate 300 with expanded storage capacity of 256k Bytes. The PocketMate 400 replaced the PS-6960Si. • A calendar from January 1960 to December 2059. Dismantling this PocketMate 400 manufactured in 1997 by Compal Electronics in Thailand reveals no surprises. The printed circuit board (PCB) looks very familiar to us and we identify the major components immediately. The hardware resembles more or less its predecessor PS-6960Si and is still centered around a Toshiba T6M88 Application Specific CPU based on the 8-bit Z80 core. The program memory is labelled AB23512 0063, probably an OTP-ROM with a capacity of 64k Bytes. We know the AB23512 already from the PS-6860Si, while the original PS-6700 makes use of the ATMEL AT27C512 OTP-ROM. The data memory of the PocketMate 200, 300 and 400 is specified with 64k Bytes, 128k Bytes resp. 256k Bytes - the layout of the printed circuit board (PCB) suggests immediately the technical solution: The PCB accommodates one or two different sized memory chips in a very flexible configuration, this PocketMate 400 hosts two EPSON SRM20100 chips sporting a capacity of 128k Bytes, each. The most obvious design change from the PS-6960Si is the new configuration of the two display drivers. While the PS-6960Si uses two driver chips in Chip-on-Board (COB) technolgy on the Main-PCB, are they now located on an additional PCB hosting the numerical keyboard. 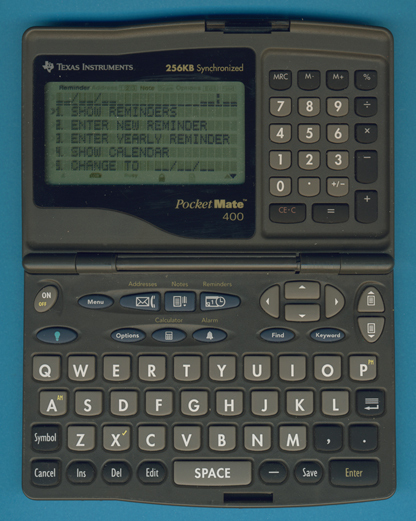 The PocketMate series was together with the Avigo 10 the last organizer in a long line started with the PS-6200 and the simpler Mini Data Bank. About one year after the Organizer series was discontinued the TI-83 SE graphing calculator appeared with an integrated organizer function!